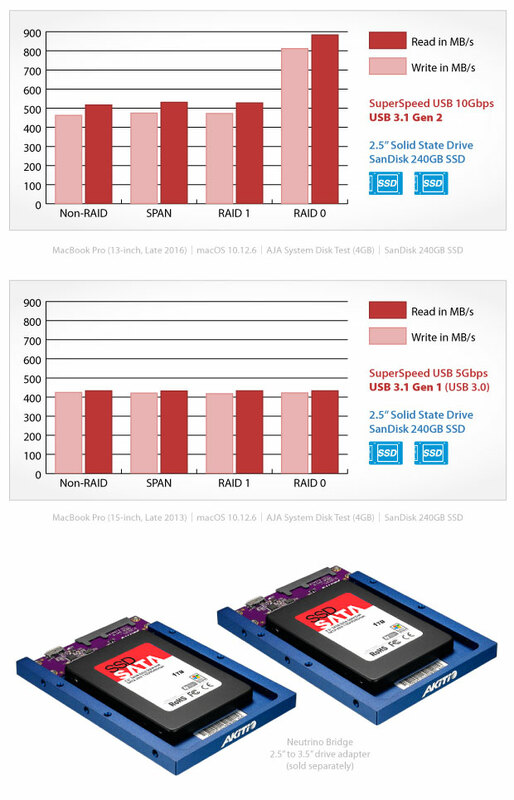 Results will vary depending on the test environment and the drives but in order to really experience the faster transfer rates of the USB 3.1 Gen 2 interface at speeds of up to 10Gbps, it’s necessary to install two SSDs and create a striped RAID set. For traditional 3.5″ hard disk drives, the transfer rate is limited by the disk itself. 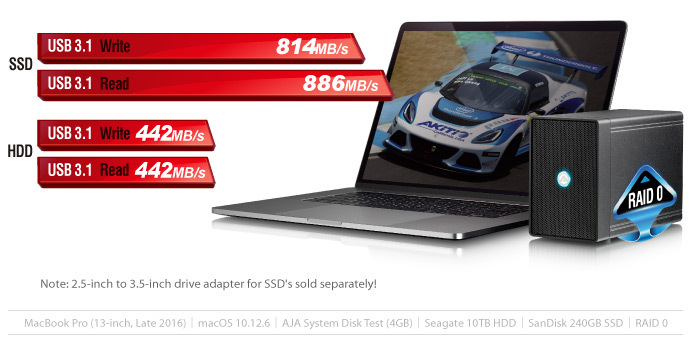 Depending on the RPM, the maximum disk speed is around 100-200 MB/s. 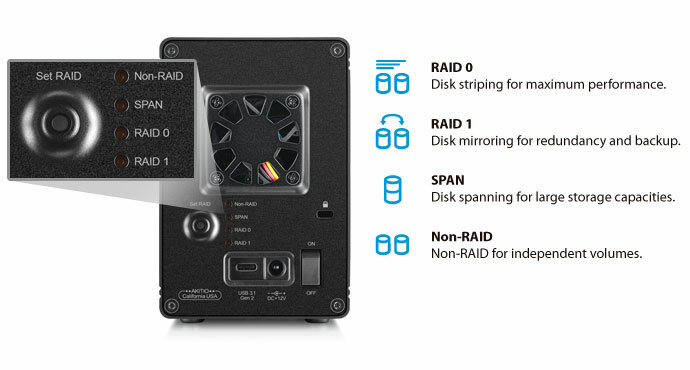 Even when using RAID 0, the transfer rate is limited by the disk speed to around 400 MB/s, no matter if the device is connected to a USB 3.0 computer at 5Gbps or a USB 3.1 Gen 2 computer at 10Gbps. 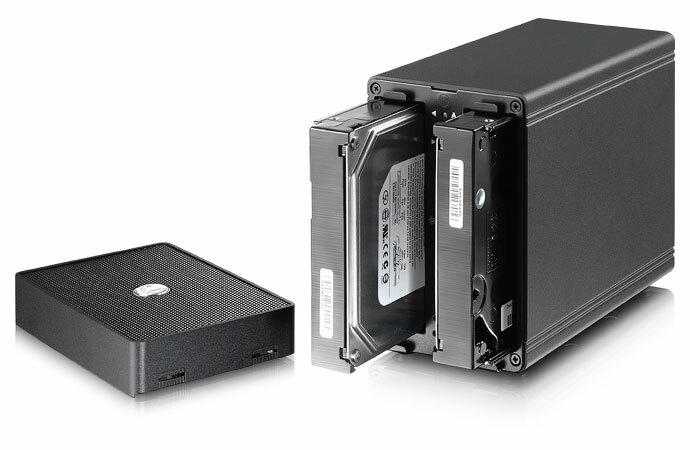 Even though the NT2 U31C storage enclosure is not designed for the smaller 2.5″ drives, it’s still possible to install and use SSDs with a 2.5″ to 3.5″ drive adapter like the Neutrino Bridge for example. When the device is connected to a USB 3.0 computer at 5Gbps, the transfer rate is limited by the USB interface to around 400 MB/s. 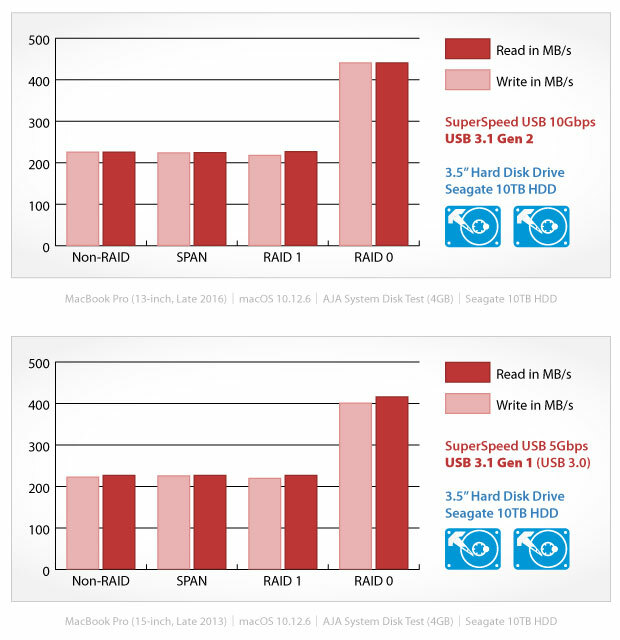 When it’s connected to a USB 3.1 Gen 2 computer or a Thunderbolt 3 computer, the SSDs can run at full SATA 6Gb/s speed and deliver around 500 MB/s or around 800-900 MB/s when striped in a RAID 0 set.